Langs Gouden Draden. 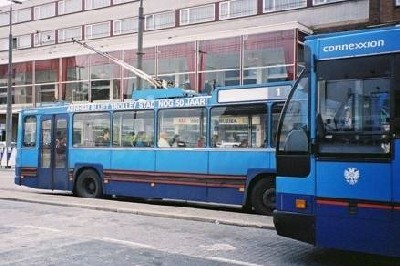 The title of the book published to celebrate Trolley 2000, the 50th anniversary of the trolleybus in the Dutch City of Arnhem. Arnhem looked into the idea of adopting the trolleybus before the war and , but before they could do anything the city was invaded. During the war, the tramway system was completely destroyed and motorbuses were used to temporarily replace the trams. Rather than rebuilding the tramways, the city ordered trolleybuses and on the 15th September 1949 at 1:30pm the city held the official opening of the trolleybus system with the route from Oranjestraat to Velp. Being in the east of the Netherlands, Arnhem is unusually hilly and so the trolleybuses show their advantages to a good extent. 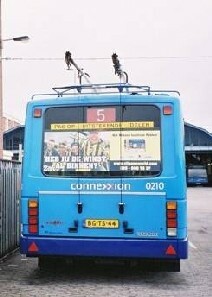 The vehicles are currently run by Connexxion, the national bus company, and until 2000 carried the slogan "ARNHEM TROLLEYSTAD" on the side to proclaim Arnhem's unique status as the only "Trolleybus City" in the Netherlands, the other 3 systems having closed at around the same time as the demise of the trolleybus in the UK. 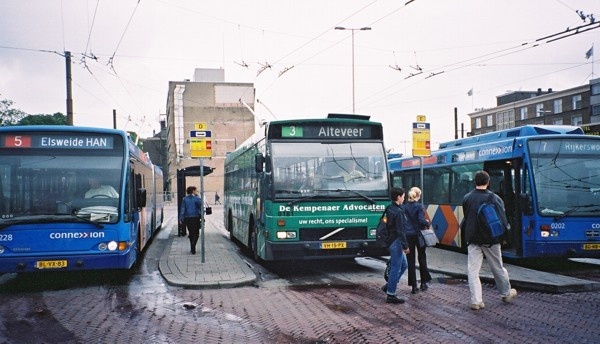 This was replaced by "ARNHEM BLIJFT TROLLEYSTAD" for Trolley 2000, which loosely translates to "Arnhem is staying Trolleybus City" some vehicles carrying "ARNHEM BLIJFT TROLLEYSTAD NOG 50 JAAR", which is a promise for another 50 years. It has been rumoured that Connexxion is looking to consolidate some of its operations by going for dual fuel vehicles, which can operate for short distances on auxiliary diesel engines to allow extensions of routes beyond the wires. 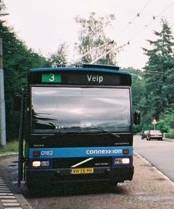 These types of vehicles are very common in mainland Europe and Arnhem has run a Ghent Van Hool dual fuel trolleybus for evaluation. 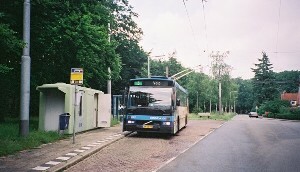 Arnhem currently runs a mixture of both rigid and articulated trolleybuses. 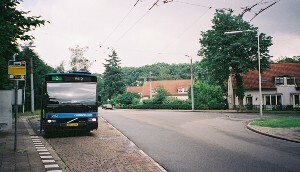 As in Ghent, sometimes motorbuses stray onto the trolleybus routes. The wiring in the city centre is quite complex and there are several frogs in the Willemsplein and the bus station as most routes converge onto these two areas. All frogs are automatic as all trolleybuses are driver only. The ticketing system is the Nationale Strippenkaart, which uses a simple ink stamp with the zone number, week number, day and time to the next quarter of an hour. The whole country is split into zones and for any journey, you have to stamp your ticket to cancel one strip for the basic tariff and one for each zone you travel in, including changing from one route to another. You can even use one ticket to cover more than one person, provided the correct number of strips are cancelled. The ticket is valid for 1 to 6 hours, depending on the number of zones. 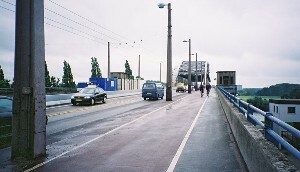 I visited Arnhem in August 2001 and June 2002 and managed to capture a few photographs of this rather impressive system. Alteveer terminus, bound for Velp. Like many routes, line 3 is a cross-city route. The building houses a coffee machine for the drivers. The foundation stone of the original depot. 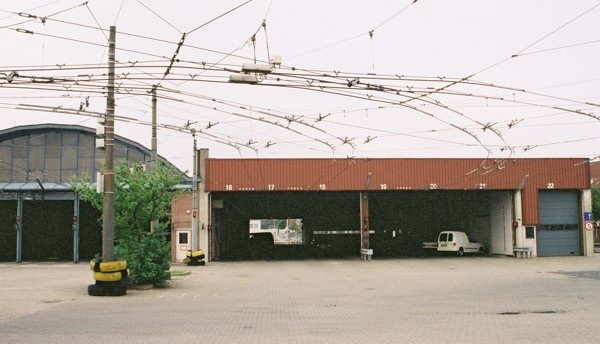 The bus station at Arnhem railway station. The "knitting" at the depot. The strange looking boxes make up one of the automatic frogs. The wiring is too low to operate double deck vehicles. several trips, most in the trams, using the automatic machines.